Drymorjoc hatched in a wilderness swamp south and west of the the western end of Tanglewood only a few leagues south of The Mount of Walls and its summit crowning city Walton. His clan of black dragons hunted the swamp and surrounding plains, losing a member occasionally to adventurers based out of Walton and retaliating against the city for their insolence. In general, Drymorjoc lead a peaceful youth. Drymorjoc fathered an number of hatchlings to continue his clan's existance, the most famous of which was his son Dryjajidu the future cohort of Zodyu the Grotesque. 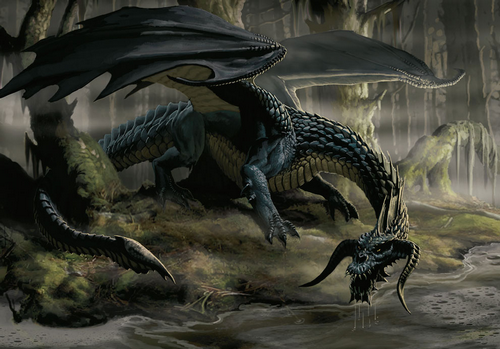 However, human expansion and the ascendance of a clan of green dragons in the expanding forest of Tanglewood took its toll and eventually left Drymorjoc and Dryjajidu the only black dragons left in the area. About the time Dryjajidu struck out on his own, a juvenile green dragon from the south called Cedarcleaver took up residence in the cedar groves on the north edge of Drymorjoc's swamp. They coexisted, competing for resources until the rise of Seigneaurie Grotesque and The Seven-Years War, when Zodyu the Grotesque recruited the dragons in the area to fight for him. The Overlord Zodyu the Grotesque was too influential to resist and Drymorjoc served the tyrant as the mount of his general Seaver Warrick. He fought several battles in The Seven-Years War, but needed constant reminding by the overlord that uncooperative dragons were expendable. Dryjajidu, Zodyu's favorite, convinced his father time and time again to remain in the overlord's service, as the rewards would be great once Legion Hedge was conquered. As Seigneaurie Grotesque victoriously marched into Schloss Sternzweck, the capitol of Legion Hedge, mages throughout the world began to erupt in vast, devastating balls of arcane fire. At the same moment, Zodyu along with Dryjajidu were drawn into the outer planes as new divinities leaving Drymorjoc free of his fetters and immediately turned on General Warrick. After annihilating the battalion he was attached to, Drymorjoc returned to his swamp as the world recovered from the cataclysm's effects. Drymorjoc returned to the ways of his youth, hunting throughout the wilderness and retaliating against adventurers from Walton until the city-state's destruction. His activities lessened as he grew into a great wyrm, until he passed from memory. Events of the new year of the thousandth year since the turn of the Cycle mysteriously roused Drymorjoc. The settlement of Marshe's Edge had grown and the stench of Walton had returned, but much closer than before. His first flight in centuries revealed the existence of Troll's Bridge. In the sky above the city, Cedarcleaver rose from Tanglewood to meet his erstwhile comrade from a millennium ago. There, the great green wyrm explained to the great black wyrm the disturbance that had awakened the world's most powerful black dragon: The Keeper of Dragons had appeared.